ET Furniture is a Responsive Furniture eShop Joomla Template. 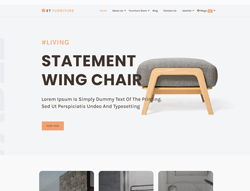 Furniture Website Template covers those needs with visual features such as gallery scripts and fully responsive designs coupled with Google fonts. You can easily edit both visual and content with the user-friendly Admin Panel. It also builds with latest Bootstrap CSS Framework, Support Font Awesome and K2 extended style. It comes with 4 color schemes helping to create excellent websites with various layouts. Furthermore, visitors get treated to convenient navigation features such as back to top buttons, tooltips, drop-down menus, search functions, and more. Should they wish to make orders, purchases, and inquiries, the contact form, among other features, will make getting in touch with you easy. If you have an actual furniture showroom somewhere, you can pinpoint its location online via Google Maps. Browse Furniture Website Templates for interior & furniture and choose the template you like today!